The recent FiDA Partnership trip to China was eye-opening in many ways: ranging from the speed of adoption of digital financial tools to the sophisticated ways in which financial services are built around nuanced client behavior to the rapid growth of online to offline linkages. We heard a lot about “A, B, C and D”: the use of Artificial Intelligence (AI), Blockchain, Cloud Computing and Big Data to transform how financial services are developed and delivered. We were particularly impressed with advanced applications of AI and Big Data and the critical “behind the scenes” roles they play. In this blog we highlight some illustrative examples from China, identify how these approaches can be applied to the African context and suggest some practical approaches to begin to harness the potential. The use of AI and Big Data is pervasive in the development and delivery of financial services in China. For example, Yirendai, the largest P2P lending platform in China and a rapidly growing investment platform, relies on AI to help customers evaluate risk and recommend loans. Their automated bot, Yiri, which provides investment advice and education, has led to an increase of 50% in assets under management and is slated to be the primary entry point to all of Yirendai’s services. In another example, WeBank, partly owned by Tencent, has built an advanced back-end platform relying heavily on AI and Big Data to support a range of accounts and transactions. The service, which they white label and license to financial institutions, costs ~$1/customer/year at scale, nearly fifteen times less than a traditional banking platform. WeBank has achieved this impressively low cost through heavy use of chatbots (which handle 96% of transactions) and reliance on AI for preventative maintenance and to achieve other back-end saving. AI is also used to assess microloans, drawing on tens of thousands of data points using both financial information and WeChat’s social data to assess creditworthiness. With this sophisticated technology in the back-end, one-third of people who draw upon WeBank credit have no previous credit history — and the non-performing loan rate is below 0.7%. And Alipay, owned by Alibaba, relies heavily on big data, AI and biometrics to assess credit risk and reduce fraud. Able to reduce the fraud rate to 0.001% (as compared to 0.2% for PayPal) and relying on large economies of scale, Alibaba has driven down transaction costs to well below 1% (compared to 3% to 4% at PayPal) and close to zero for P2P transactions. They also proactively “white list” users based on a large number of factors. These stories of low-cost scale provide a glimpse of how leading companies in China have embraced AI and Big Data to extend the reach of financial services. Indeed, many consider themselves technology companies first, which happen to provide financial services, and have adopted the TechFin moniker. While China does benefit from a somewhat unique enabling environment, there are a number of ways in which companies in sub-Saharan Africa could benefit from strategies employed in the digital finance revolution in China. Some of the “lowest hanging fruit” involves extending knowledge gained and approaches taken using AI to the African context. Talent to effectively use AI techniques has been a barrier in the past — but through a combination of using newly-available advanced tools (e.g., WeBank example), a growing talent base in Africa and the ability to rely on talent from outside the region, these concerns can be ameliorated. AI tools typically require large amounts of aggregated data. Mobile network operators (MNOs), and to a lesser extent financial institutions and PayGo Solar players, possess or are amassing such data. Through strategic partnerships and adoption of existing tools these companies could be doing more with the information they have, for instance predicting payment behavior to reduce churn. For now (due to regulatory concerns around sharing/selling data), the use of AI and Big Data may be limited to optimization within companies, but in the future data sharing across companies may be able to provide a more detailed and nuanced understanding of clients. 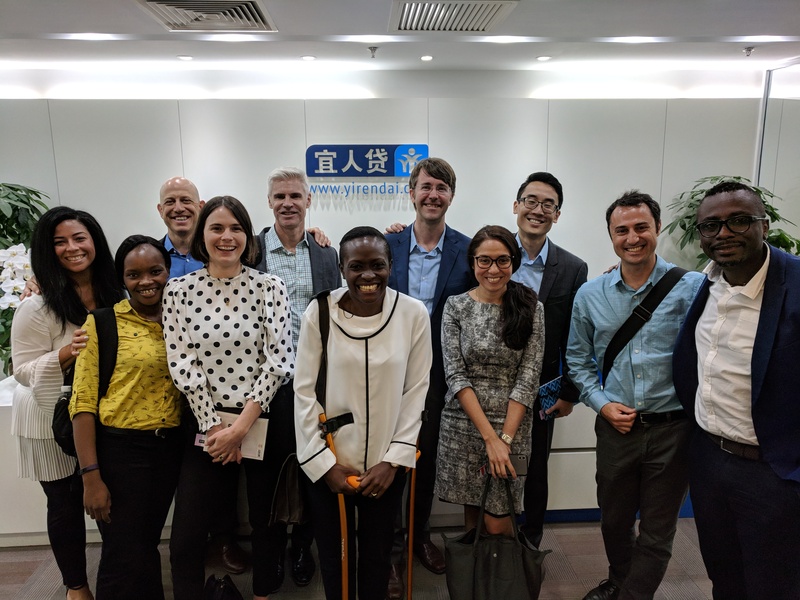 African companies can learn from the value of big datasets and creative partnerships (to build big and diverse datasets) which we observed in China. While leveraging big data in Africa is still in its early days, the opportunity should be taken seriously. The opportunities on the “back end” are more immediate than those on the “front end”. This begins with the low penetration of smartphones (relative to China) and on-going reliance on USSD. While China made a rapid leap from feature phones to using smartphones to read QR codes and conduct financial transactions, in sub-Saharan Africa the path has involved mobile money and slower adoption of smartphones. The leap in China has enabled sophisticated use of AI on the front end — such as biometrics for KYC and facial recognition based on selfies — which will only be possible in Africa with big advances in smartphone usage. The “silver lining” of the African path may be the extensive CICO agent networks — which generate a large amount of data. While lacking e-commerce and smartphone data, the AI journey in Africa can draw upon the data held by MNOs, financial institutions and PayGo providers, and benefit from the growth of smartphones. Indeed, we are already seeing companies like Pezesha, Tala and Branch capturing their own data from their apps. So what can be done now? We will close with a few pragmatic recommendations of actions that can be taken by companies in sub-Saharan Africa to benefit from advances in AI and Big Data seen in China. We were struck by the degree of collaboration between companies in China. This ranged from sharing data to using advanced tools to better understand and serve clients (see recent blog on this collaboration). Neobanks in Africa should consider using advanced tools from WeBank and other providers (from China and elsewhere). To the extent allowed by regulators, MNOs, Financial Institutions and PayGo providers should share data to develop richer consumer profiles. Companies should consider “non-traditional” types of data — both information that may be lost today (in China factors such as how hard a user pushes on the screen and the angle the phone is held are captured and considered) and “non-traditional” sources of data (companies tapping into alternate sources of data exist in Africa — but much more could be done). When brought together these often yield unexpected insights about consumer behavior. Knowledge of local context combined with thoughtful, applied use of data holds a lot of potential. As smartphone penetration expands consider creative approaches to tap into the multiple data streams. Companies today are just skimming the surface of what can be done. Over the longer term the home-grown talent base must be strengthened. Institutions such as Ashesi University in Ghana, the African Leadership Academy in South Africa and the Mastercard Foundations Scholars Program are pioneers — and others can and should learn from them.